The average price of a Canadian home increased by 6.3 per cent in the past 12 months to more than $431,000 in February, the national realtors group says. The Canadian Real Estate Association said Friday that much of the gain is due to hot markets in Toronto and Vancouver skewing the average. If those two cities were stripped out, the average house price would have dropped to $326,910 and the year-over-year gain would have shrunk to just 1.5 per cent. That's actually less than the current inflation rate. Outside of prices, sales volumes were way down in some places. Sales in both Edmonton and Calgary are down 34.5 per cent and 16.7 per cent from the same month a year ago, TD Bank noted of the data. 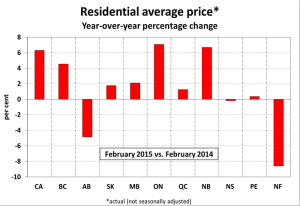 "A number of buyers across the Prairies stayed on the sidelines in February," CREA president Beth Crosbie said. "That’s likely to remain an important part of the national housing story until the outlook for oil prices starts improving"
February isn't typically a strong month for home sales, but the number of sales was below the 10-year average for the month in two-thirds of all housing markets across the country. But more sales than normal in Toronto and Vancouver, coupled with higher prices from bidding wars, appear to be enough to skew the national average higher. "This morning's data release painted a picture of an overall Canadian housing market that is neither too hot, nor too cold," was how TD Bank described the national housing market as a whole in a note to clients on Friday.